Local floral shop, Abundant Flowers, located at 1805 S. Air Depot Blvd. in Midwest City tried something new last month by offering a Wine and Design class. 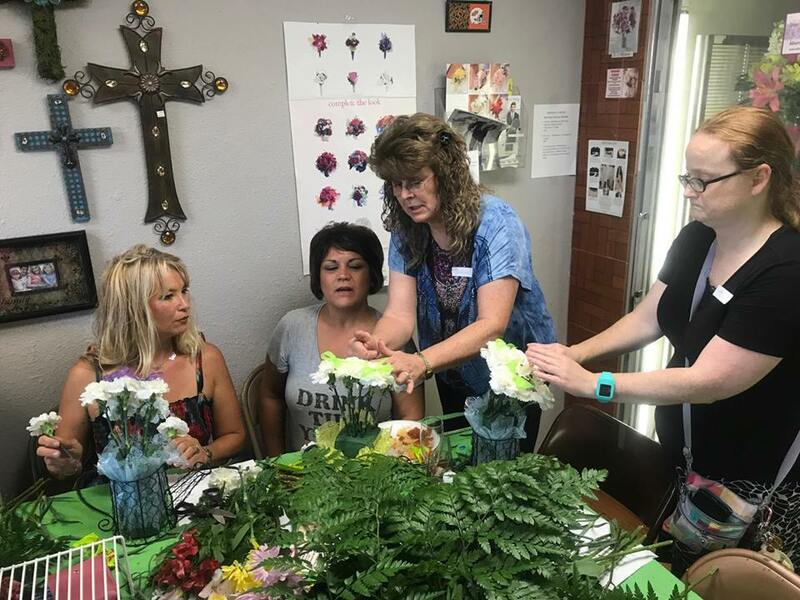 The class, held on August 29, offered patrons a chance to come learn how to make a puppy floral arrangement while enjoying refreshments, which included fruited moscato wine and cheese and crackers. Owner Debbie Wesley said that she found the idea on a florist blog. I saw the class advertised on Facebook and thought it looked like it would be a lot of fun, especially as something I could do together with my daughter. I signed up and sent them an email and they allowed me to bring my daughter and work on the project together without enrolling her separately. The class as a whole was interactive and lots of fun. The design was easy enough for anyone without floral arrangement skills, yet provided enough challenge to make it interesting. Although the class was a step by step process with everyone making the same thing, they also offered ways to put unique touches on your puppy like different eyes and different colored bows. The staff were knowledgeable and friendly and made it as entertaining as possible. Owner Debbie Wesley giving one on one help to some of the members of the class. The class lasted about 2 hours and the cost was $25 per person which included all of the supplies. There were 18 people registered for the class, and everyone got to walk away with a floral arrangement that they had made. Among the door prizes given away it included a beautiful arrangement of one dozen red roses, and special deals were available during the event. My daughter Starla and I working on our arrangement. Shelley Owen working on her floral arrangement. There will be more opportunities to do just that, the next Wine and Design class will be held on September 26 and will feature a birthday cake floral arrangement. Wesley plans on hosting a Wine and Design class once a month, including a cornucopia design in October and a partridge in a pear tree design in November. The Abundant Flowers Facebook page has created FB event pages for the classes, where you can reserve a spot and find out more information as well. Wesley has owned Abundant Flowers since 2002, and has been in this current address for the last 4 years, having moved from SE 15th street prior to that. The shop delivers to OKC, Moore, Norman, Choctaw, Harrah, Del City, and Midwest City and also gives free deliveries to Tinker. They also offer a free single bud vase to anyone who comes in on their birthday. 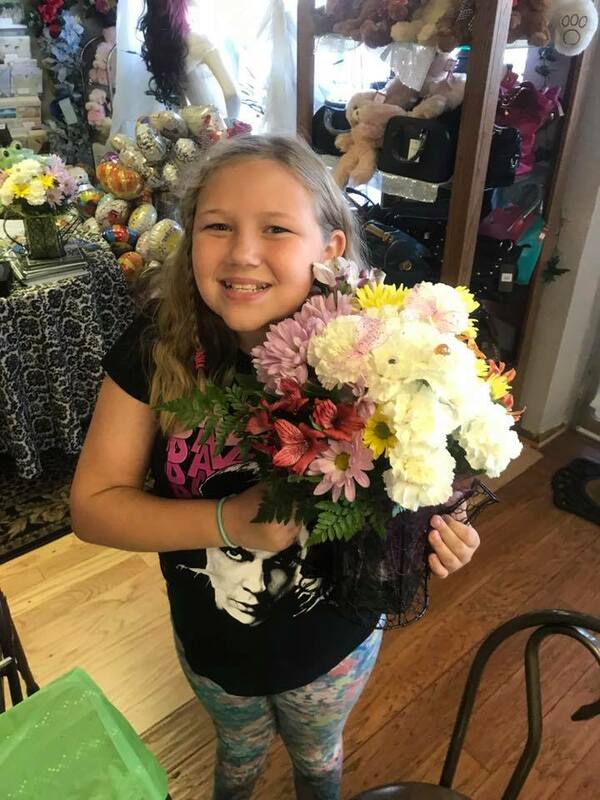 The shop has a bouquet special called “Make her day” bouquets for only $14.99 that is a big hit with customers. Wesley says that they love doing weddings as well. Forrest Freeman (PR and Delivery driver), Debbie Wesley, Mindy Skinner (patron who took the class) and Daryl Sandlan (floral design and deliveries). In fact they offer this “one stop wedding shop” with all of these businesses on a website at www.midwestcityweddings.com, but their main website is at www.abundantflowers.net. You can visit both of those sites for more information about Abundant Flowers and everything that they have to offer. Starla proudly shows off our puppy.